Welcome to the first installment of “What Works For Me Wednesday”. These will be little tips and tricks that work for me personally. Some will be crazy or seem silly, but like I said, they work for me. Hopefully something might help or inspire you to come up with some creative ideas to get your fitness on. Visuals. I love visuals to help keep me motivated. I have a calendar hanging in my master bathroom right by the mirror. The calendar is a special one. My husband makes one for me every year for my birthday. You know, the kind you can make online with photos. He uses our family photos of the past year so I love to look at it! This calendar is where I log every.single.workout. I also log my weight there, but I only weigh once a week. Sometimes less (I stay the hell off the scale when I know I’ve been bad or feel bloaty). Weighing myself often does NOT motivate me and the key here is to find what works for you. By having the calendar in my master bathroom and using it for logging workouts, I have to see that sucker the whole time I’m getting ready for work. And when I don’t work out? I put a big fat X on the date. I hate seeing those Xs. They really piss me off so I’m even more motivated to workout. Does this make me immune to slumps? 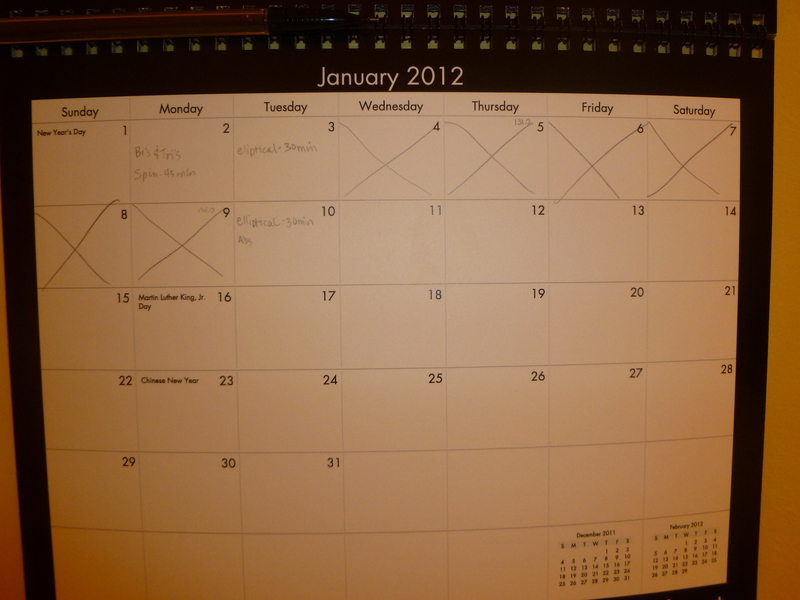 (You can see from an actual snap shot of my calendar below that’s definitely not the case!) Although I sure wish it did. But the calendar does make me keep it real. If I’m wondering why I’m tired, feeling sluggish, fat, mushy…I look at the calendar. How many workouts have I done? How many Xs are there? Visuals…helping me keep it real. This entry was posted in Finding Balance, Goal Setting, What Works For Me Wednesday and tagged balance, fitness, Mojo, Motivation, What Works For Me Wednesday. Bookmark the permalink. I love the calendar in the bathroom idea! !